Explanation: Vesta is a huge rock 500 kilometers across that orbits out past Mars. 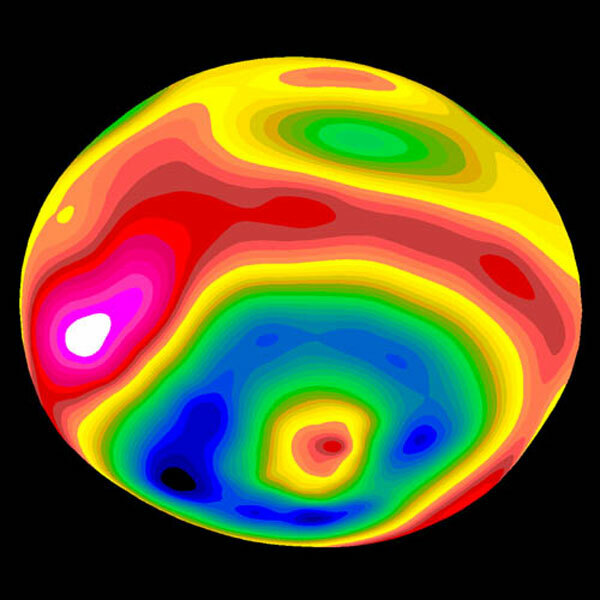 In 1997, the above map of Vesta created using the Hubble Space Telescope was released showing a rugged surface highlighted by a single crater spanning nearly the entire length of the asteroid. The large crater dominates the lower part of the above false-color conglomerate image: blue indicates low terrain, while red indicates raised terrain. Evidence indicates that Vesta underwent a tremendous splintering collision about a billion years ago. In October 1960, a small chunk of this rock believed to have originated on Vesta fell to Earth and was recovered in Australia. Vesta is considered by some to be a candidate for reclassification into a planet.